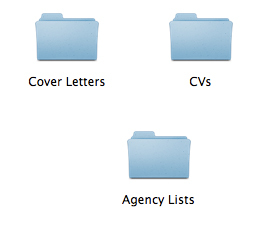 Before you start your jobsearch ensure you have somewhere to store the paperwork you will begin to generate. Keep it all; you will need it. Bundle all of the paper together relating to your job applications; be it newspaper clippings, printouts from the internet and the applications themselves. This sounds fussy but it’s worth the effort. Take our word for it. Always make copies of your application forms before you send them. You will put your heart and soul into these application forms; you will dream-up fantastic phrases and find new ways to express yourself. A whole day can be spent completing an application form so it would be unwise to just send it off without keeping a copy. Once you have applied for a few jobs the work gets easier. You can use your old application forms to help you fill out the new ones. Be creative: a paragraph from here; a line from there; a dazzling phrase from here. The more applications you complete (and keep hold of) the easier it will be. Before long you will be a master. The first step on your jobsearch is to tell people you are looking for work. You already have a network of friends and acquaintances and those individuals in their turn have their own networks. Many people have success in their jobsearch just by putting the word out. Everybody knows someone else; use this free resource and it can pay dividends. And don’t be shy: everyone has a period of unemployment in their lifetime and if you’re looking for a job as a cashier, smile and tell the cashier as you pay for your groceries. Most people then turn here, to the internet. Get a hit-list together of the companies you want to work for: Bookmark their recruitment pages. Visit at least once a week. Learn their recruitment patterns; speak to their Human Resources Department if you want to. Ask them what they may be looking for. If there’s a mould, you need to fit it. The internet; newspapers; word-of-mouth; recruitment agencies. All of these are the circles to move in to find work. No one circle should be relied upon too heavily. Share your time amongst your resources. has blocked 333 access attempts in the last 7 days.